World champions Germany are in action tomorrow when they take on Mexico in their opening Group F game and head coach Joachim Low has provided a key fitness update to two of their star men. 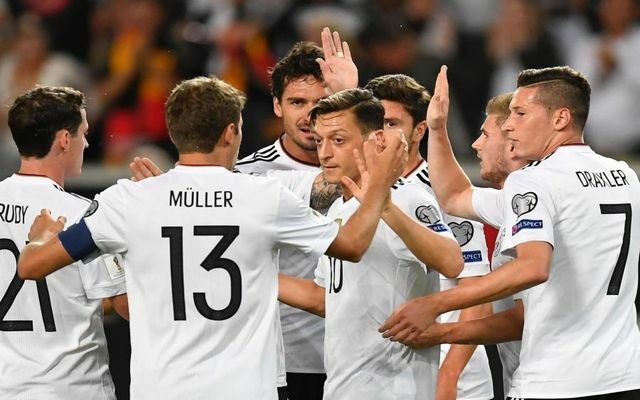 The Germans will be looking to become the first country since Brazil in 1962 to win the famous trophy twice in a row but will need their two stars in Manuel Neuer and Mesut Ozil to inspire them. Both had fitness doubts ahead of the tournament with Neuer going through an injury-ravaged season with Bayern Munich whilst Ozil missed Arsenal’s last two Premier League games with a back injury – however Low provided positive news for German fans when he revealed all of his players were fit. As per Sky Sports he said: “Neuer is making a very stable impression on me. The last few weeks he has been very focused, very calm, he has worked hard to come back. There were concerns in particular with Ozil after he was withdrawn during Germany’s warm-up game against Austria last week – however Low put to bed any doubt regarding his fitness. “All players are fit. Mesut Ozil has put in two additional training sessions this week,” Low said at a press conference, as reported by Sky Sports. Ozil has been a key part of the international set-up for many years and dreams of winning the tournament by beating England. Germany will need the Arsenal man to be firing on all cylinders and add to his 67 goals/assists combined in 90 appearances for his country if they are to have any chance of winning again.